This college preparation book addresses higher education in a whole new light—by prompting students to get to know themselves first. 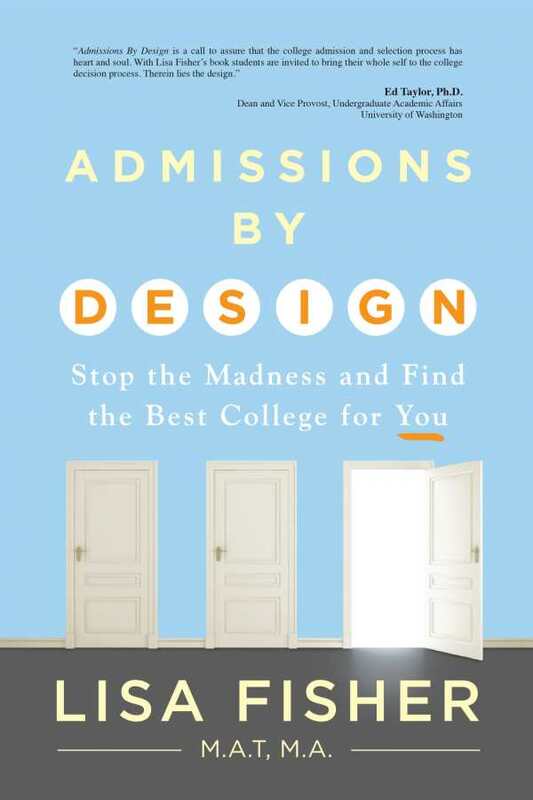 Unlike conventional college admissions books, Lisa Fisher’s Admissions By Design artfully addresses higher education in a whole new way. High school students and their parents who are anxiously seeking advice on how to select and apply to the right college may not find exactly what they are looking for in the pages of this unusual book. What they will find, however, is a bold and refreshing take on attending college that is, in reality, a guide to preparing for a successful, happy life. Fisher, a teacher, college counselor, and educational consultant, calls her approach “a new paradigm in thinking about the college admission process,” and indeed, that is an accurate description. Rather than concentrate on the details of entrance exams, financial aid, and applications, the book helps each individual design his or her own path to a purpose-driven future. The book begins with a sobering assessment of the “culture of crazy” that consumes college-bound students who are driven more by such conditions as high achievement, “activity overload,” and fearing failure than by finding appropriate college choices. Next is an examination of the physical and mental toll such an environment takes on a student. While some of the material here is a bit dense (as in the explanation of parts of the brain), it sets the stage for why students and their parents should view the college admissions process differently. Fisher’s belief is that the student, not the school, should be at the center of the process—a notion that empowers students to make college choices based on their own unique attributes and needs. The remainder of the book is a walk through the “U Map,” meant as a journey to knowledge of self and to spur creative action. The U Map is depicted graphically and also described in great detail in chapters that explore each of its engaging nine steps, including “Get Quiet,” “Synthesize,” “Crossing the Threshold,” and “Evolve Toward Purpose.” The author is logical and methodical in guiding the reader through each step, using a combination of text, examples, and interactive exercises. Admissions By Design is not only well written, it is precisely targeted to high school students. The text neither talks down nor oversimplifies; it is written in a knowledgeable voice that is encouraging but makes it clear that each student must bear personal responsibility for his or her life. There are plenty of subheads, short sections, highlighted text, and exercises to facilitate reading and understanding. The quotes from students that appear in large type throughout the text are pertinent and enlightening. A comprehensive list of resources is included at the end of the book. The simple yet attractive cover design is eye-catching. Students looking for an easy route to college admissions will not find it here; however, those who are willing to do the work will discover much more than a path to college—they’ll really get to know themselves by reading Admissions By Design.